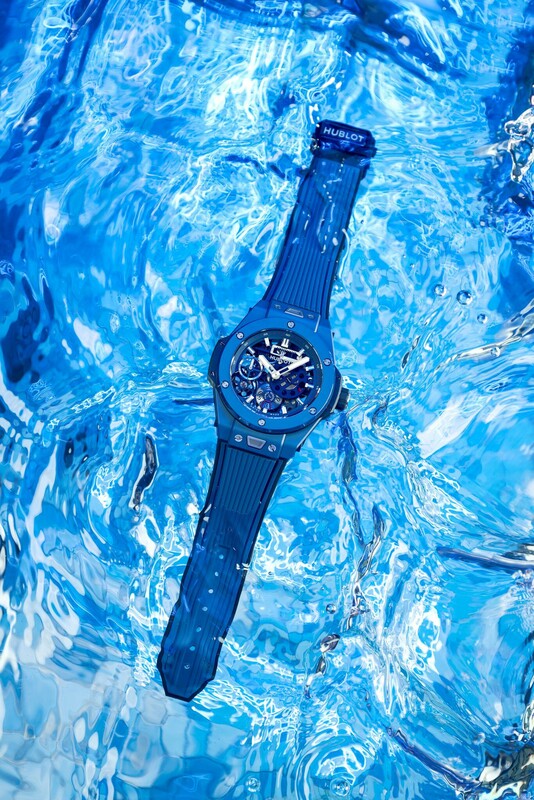 Hublot’s ‘art of fusion’ is that rare thing, a mission statement that actually means something, and it works on several levels, as a new, blue ceramic edition of the Big Bang Meca-10 neatly shows. The brand’s starting point with product design is to take traditional watchmaking elements and give them a twist, whether through unexpected combinations or new interpretations of an existing idea, aiming for a result that is fresh and surprising. 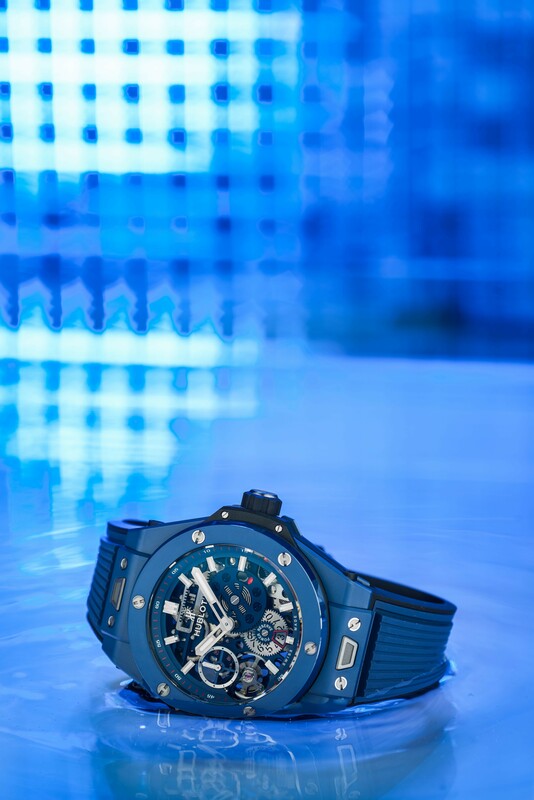 The Big Bang Meca-10 Ceramic Blue pulls together four distinct elements in a combination that’s unique to Hublot: advanced materials, a traditional movement, an architectural approach to watch design, and an extreme level of perfection, or finissage. At the heart of the watch is the HUB1201 hand-wound skeleton movement that’s able to run for ten days from fully wound. That’s out of the ordinary for a watch and achieved through two oversized spring barrels that work in parallel, linked to each other and the power reserve indicator by a horizontal rack beneath the logo. And it’s from this arrangement that Hublot has developed the design. Most skeleton watches use conventional movements and cut away anything not essential to the structure of the watch.  Hublot’s approach is the reverse, deriving the structure and aesthetic from the essential components. The result is a design that is purely mechanical in inspiration without ever falling short of traditional watchmaking standards. With the power reserve at the heart of the design, there are three ways to see how long the watch will run for: the rack that links the barrels moves from left to right as the springs unwind, providing a snapshot of energy remaining; the rack also links to an intermediate wheel with an indicator that, when the power reserve is in the last two days of its range, shows red through a slot; and a further link to a wheel at 6 o’clock shows the number of days left. 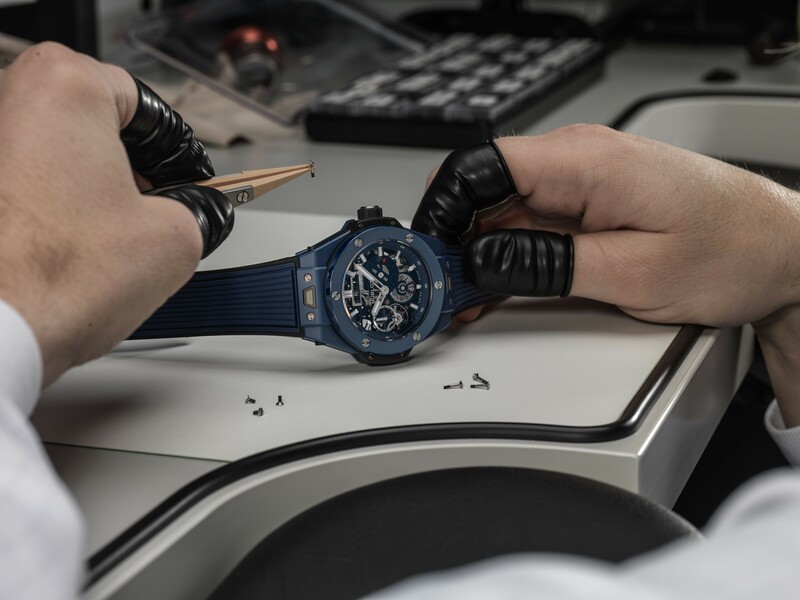 Other details, such as the bridges of the 223-part movement being plated with a blue tint to match the zirconium dioxide used for the ceramic case and bezel, encapsulate the art of fusion concept. 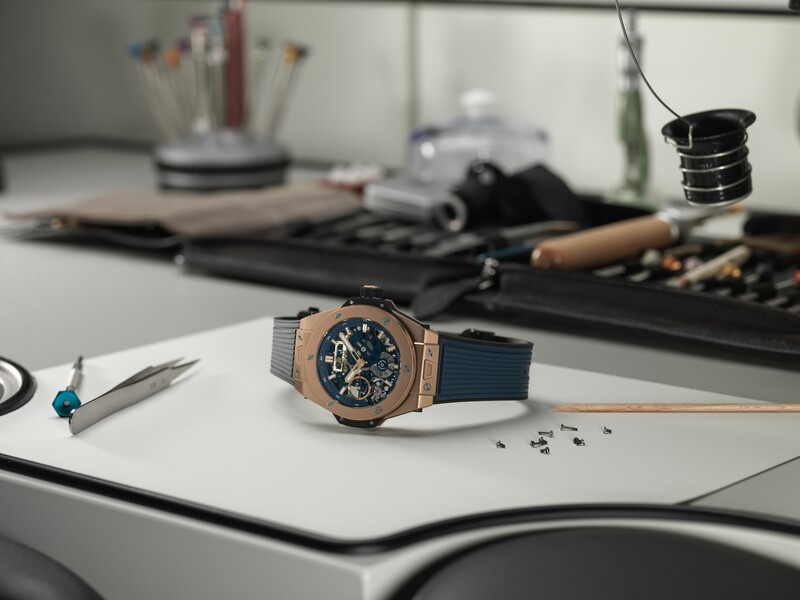 In Nyon, near Lake Geneva, Hublot’s manufacture houses all the industrial resources necessary to research, develop and produce new concepts and ideas. 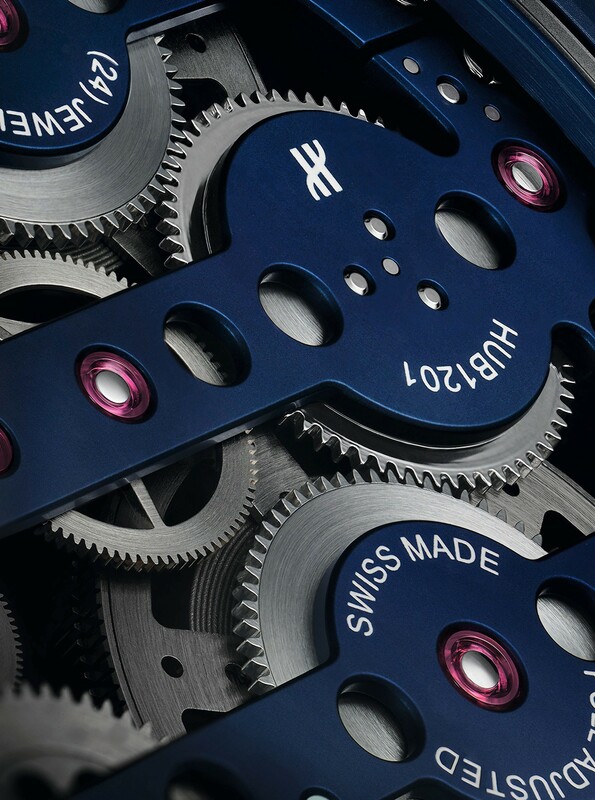 The brand allies its ability to design new movements with an unrivalled capacity for developing new materials and finishes. 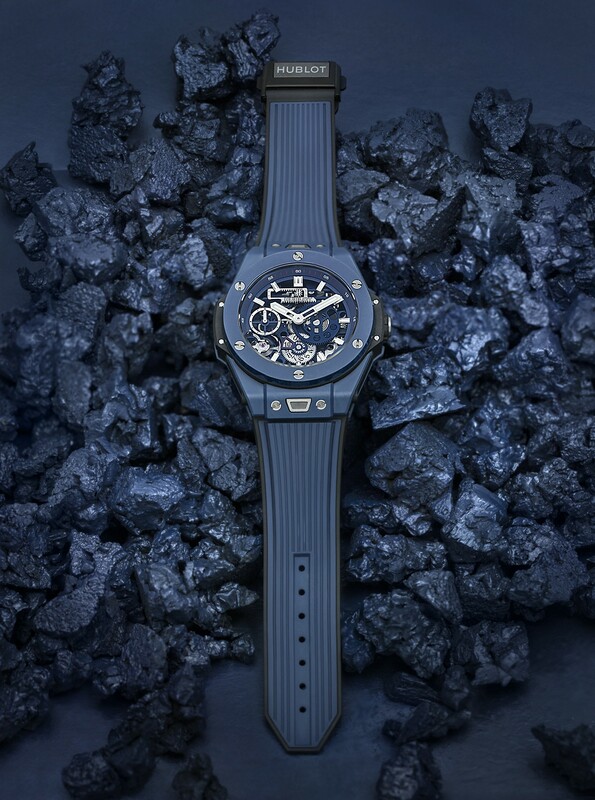 Blue ceramic is just one of a series of novel materials – ranging from rubber to tungsten to Texalium, an advanced carbon-fibre that can be combined with metal coatings – that Hublot has introduced to its watchmaking, giving its designers freedom to innovate. Typical of the brand’s material expertise is a version of the Big Bang Meca-10 that is being produced in King Gold, an alloy that’s much darker than standard gold thanks to its copper and platinum content. Developed and produced in-house to meet a design need, the alloy was formulated to resist the oxidation that can affect conventional red gold alloys over the lifetime of a watch. More detail on the Big Bang Meca-10 Ceramic Blue can be found via the banner below.